[Book Review] Subtitled, “The Astonishing Double Life of a CIA Agent Inside the Revolutionary Guards of Iran,” the book reads more like fiction than autobiography. I have no idea how much … polishing … the author did to make the story and dialog flow, but the end result is a fascinating book that reminded me of my time in Iran, my guide there, and similar experiences in other restrictive, totalitarian states. The tension in the book brings home life in nations infected with ideologues, police, and intelligence agencies run amuck. After an impressive, thoroughly readable history of the Iranian revolution, the book turns darker as the zealots gain power and remove their rivals. A Time to Betray is a ‘just one more page’ book that will keep you up well into the next morning. I can’t vouch for its accuracy or authenticity, but I can vouch for its readability. Enjoy. Interesting article in today’s Foreign Policy on the current power struggle in Iran between President Ahmadinejad (representing the Revolutionary Guards and Iranian nationalism) and Supreme Leader Khamenei (representing the clerical hierarchy and Iranian revolutionary Islam). While I disagree that, “Khamenei’s survival and that of the clerical system is in the West’s interest,” (mainly because I see an isolated Ahmadinejad, stripped of support from the bazaaris and with a weakened clerical establishment, as a far easier target for domestic reformers) the author delivers a clear overview of the two dogs in the fight. Definitely worth the five minutes it’ll take to read. A Foreign Ministry spokesman from North Korea announced the North’s takeaway from the situation in Libya: never give up your nuke program. “The present Libyan crisis teaches the international community a serious lesson. It was fully exposed before the world that ‘Libya′s nuclear dismantlement’ much touted by the U.S. in the past turned out to be a mode of aggression whereby the latter coaxed the former […] to disarm itself and then swallowed it up by force. It proved once again the truth of history that peace can be preserved only when one builds up one′s own strength [i.e. a nuclear weapons program].” Quoted from the North’s official Korea Central News Agency (KCNA) website; click here for the full report (the KCNA website is normally blocked in South Korea, so the link will likely not work if you are accessing the site from the South). The KCNA story has the rare virtue of making a good point: one of the side-effects of the current decision to give the Navy something to do launch attacks on Libya (whether you believe they are justified or not), combined with Qaddafi’s previous decision to abandon his nuclear program, is going to be strengthening the resolve of countries like North Korea to develop and maintain their own nuclear programs. I would be surprised if Iranian leaders in Tehran and Qom are not drawing similar conclusions. An artful attempt at spin, in case anyone on the planet actually thinks the attacks are retribution for the Libyans giving up their nuclear program, rather than simply made easier by Qaddafi’s previous decision to abandon his program, but one doubts Pyongyang and Tehran/Qom are so easily fooled. Somewhere Kim Jong-il, who has presided over a humanitarian disaster easily as bad as anything in Libya, is hugging his nuclear scientists. It’s a sad day when the KCNA makes more sense than the State Department. On a separate note, for a decidedly positive view of the intervention, see Kristof’s Hugs from Libyans column in today’s NY Times. For Americans of a certain age these four words are inextricably linked. The Iran hostage crisis forever burned Iran and Khomeini into our minds as emblems of danger and evil. Nearly 30 years have passed since then but stories of nukes, kooky mullahs, and oppressed women have done little to improve Iran’s image. It didn’t help that I’d decided to fly Iran Air. At first it seemed like an interesting airline to try, plus it offered a convenient connection from where I was staying in Seoul. The problem was that the flight would be on an old Boeing bought before Iran’s Islamic revolution in 1979. U.S. economic sanctions have since prevented Iran Air from doing much upkeep and modernization – meaning the most dangerous part of the trip could well be the flight in. (DAY 12) Newspapers, websites, TV news – it seemed that every one of them had run a feature on Iran’s rejuvenated nuclear program in the days leading up to this part of my trip. 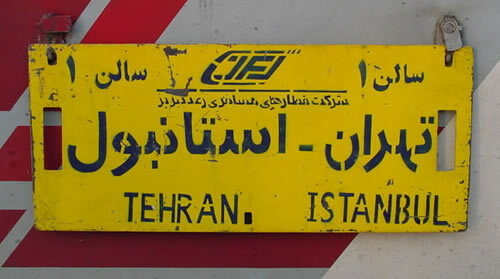 In nearly every story Esfahan was listed as the major city closest to the program’s home. There were so many stories it actually felt like driving into a spotlight, like being back in Baghdad, knowing you were at the center of world attention.